Over the last several months, Governor Wolf traveled the commonwealth to hear from people on the front lines of the opioid crisis, and everywhere he went, he was told that we cannot afford to wait any longer for more resources to expand treatment for people suffering from addiction. 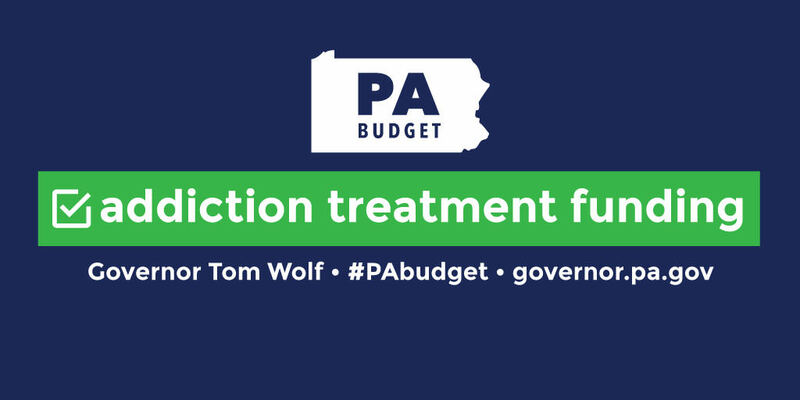 Working with the legislature, Governor Wolf secured critical funding in the budget to establish new treatment centers and improve treatment options for Pennsylvanians struggling with substance abuse disorder. The budget included $10 million in behavioral health funding and $5 million in medical assistance funding, totaling $15 million. This will allow DHS to draw down $5.4 million in federal funding for an overall total of $20.4 million. This critical funding will enable the Department of Human Services, during phase one, to implement 20 Opioid Use Disorder (OUD) Centers of Excellence that will treat approximately 4,500 people that currently are not able to access treatment. The Department is also working with its actuaries to determine the number of additional centers that can funded with the $5 million in state Medicaid funds and $5.4 million in federal funds by analyzing the impact they will have on Medicaid managed care rates. The Department of Human Services will announce the additional Medicaid-funded OUD Centers of Excellence in August. Once established through the Department of Human Services, the proposed OUD Centers of Excellence would be the first stop for people in need of treatment – providing medication-assisted treatment and connecting those in-need with appropriate wraparound services, such as cognitive-based therapies and employment assistance. In 2015, more than 3,300 Pennsylvanians died from a drug overdose. Heroin and opioid overdose are the leading cause of accidental death in Pennsylvania, killing more individuals each year than motor vehicle accidents. Our fight against this epidemic is not finished. Governor Wolf will continue to travel Pennsylvania and outline further action Pennsylvania can take to address this crisis head on. Read more about the latest budget news. Read about the 2016-2017 budget’s historic increases in education.